Pattern Gauge: 11 sts = 4” 10 cm and 19 rnds = 5” 12.5 cm in St st. Cozy like a blanket and chic like your most fashionable BFF, this belted, cowl neck poncho is easily your next make-now project! Plus, it’s knit on size 13 needles (think quick knit!) 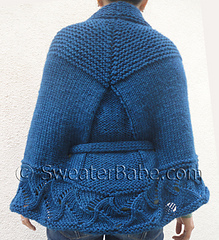 in a beautiful and soft yarn called Biggo from Knitpicks. 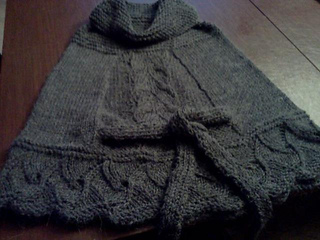 This poncho is also seamless, knit from the bottom up. Lots of textural interest is created first with a bold scroll lace border that then transitions into a slimming shaped center lace and cable panel. 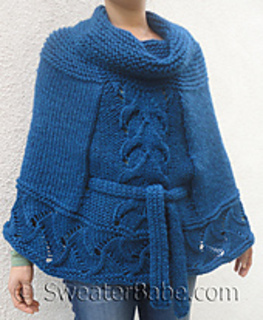 The top of the poncho is knit in Garter st, ending with a generous, and very flattering, draped cowl. A ribbed belt is the finishing touch to this unique piece.